Daniel Mendelsohn has 1 media appearance. Daniel Mendelsohn draws on his training as a classicist and an unusual intellectual breadth and depth of interests to bring to his criticism of popular culture. The New York Times has said, "Deeply considered, generous in spirit... Mendelsohn just might be our most irresistible literary critic." He is the author of seven books, including the international best selling nonfiction book about his search for information about family members who perished in the Holocaust, The Lost: A Search for Six of Six Million; two collections of essays on books, film, theater and television; and an acclaimed translation of the complete works of the Alexandrian Greek poet, C.P. Cavafy. The Elusive Embrace, his memoir of family history and sexual identity twined around meditations on classical texts, was a New York Times Notable Book and a Los Angeles Times Best Book of the Year. In 2002 he published a scholarly study of Greek tragedy, published by the Oxford University Press. His first collection of essays, How Beautiful It Is and How Easily It Can Be Broken (2008) was a Publishers Weekly Best Book of the Year; his second collection, Waiting for the Barbarians: Essays from the Classics to Pop Culture, was a finalist for the National Book Critics Circle Award in Criticism and runner-up for the PEN Art of the Essay Award. Daniel Mendelsohn’s books include the international bestseller The Lost: A Search for Six of Six Million, winner of the 2006 National Book Critics Circle Award and the Prix Médicis Etranger, and an acclaimed translation of the poetry of C. P. Cavafy, called “a tremendous gift to the literary world” by Newsday. His articles, reviews, and translations have appeared in numerous publications, including The New York Review of Books, where he writes about books, theater, film, and opera. From 2000 until 2002, Mendelsohn was the weekly book critic for New York magazine, for which he won the National Book Critics Circle Award for Excellence in Criticism. Waiting for the Barbarians is a collection of essays on subjects stretching from Mad Men to Greek myth and Spider-Man. In his latest collection of essays, the author of The Lost and The Elusive Embrace makes telling connections between diverse topics. A discussion of a recent Sappho translation leads him to consider the use of myth in Spider-Man, for example. He writes on Sontag and Noel Coward with as much energy as he does Titanic and Mad Men. Daniel Mendelsohn , The Lost. A Search for Six of Six Million. The classics scholar, literary critic and award-winning author of the acclaimed memoir The Lost: A Search for Six of Six Million discusses his search for missing relatives, the "overfamiliarity" of the Holocaust, and why we should listen to our elders. 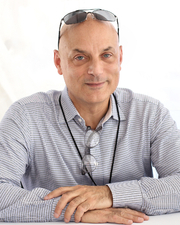 Daniel Mendelsohn is currently considered a "single author." If one or more works are by a distinct, homonymous authors, go ahead and split the author. Daniel Mendelsohn is composed of 5 names. You can examine and separate out names.